Yesterday, we posted our review of the Star Trek / DuroSport Video Download Service. As is usually the case with things involving the DuroSport Electronics Company, we thought that it was ill-conceived and kinda amateurish. Today, the link to the service has been removed from the Star Trek website. While we don’t think that our review had anything specific to do with the removal — officially, that is — it seems like the people over at Star Trek came to their senses, and cut their losses pretty swiftly. 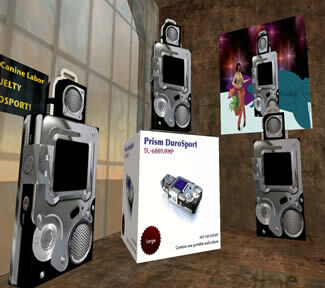 Yesterday we told you about DuroSport’s new retail outlet in Second Life. It was everything we expected a DuroSport store to be — which was exactly the problem. DuroSport has become so predictable that even their failures no longer surprise us. But there is a new development that even we find quite surprising. DuroSport has just announced an exclusive partnership with the most highly respected content franchise in history: Star Trek. Yes, you read that correctly. Star Trek. Starting today, Star Trek and DuroSport Electronics have partnered to release what they are calling “DeMastered” episodes of Star Trek: The Original Series. The episodes are being made available exclusively through DuroSport’s new video download service called — predictably — DuroView. The first thing you notice is the boxes. The huge, huge boxes, piled high on top of each other from the floor to the airplane-hangar sized ceiling. What, you wonder, could these gigantic boxes possibly contain? The only possible items are washers and dryers, refrigerators, sofa sets, even SUVs. Maybe a really huge television. But if you’re the DuroSport Electronics Corporation, then these impossibly large boxes contain your latest product: a portable virtual media player. So what’s a consumer electronics company to do when reality lets it down? Open a store in the virtual world known as Second Life, of course. The Prism DuroSport 6000 – Worst Digital Audio Player Ever! When we built the Medialoper Review Labs, we had great hopes that our first major product review would be something special, like a sneak peak of a 6th generation iPod or maybe a preview of an Origami UMPC. Neither Apple nor Microsoft responded to any of the emails we’ve sent requesting review units. Instead, the subject of our first review is the latest digital audio player from the little known DuroSport Electronics Company. You’ve probably never heard of DuroSport – we certainly hadn’t. The company contacted us earlier this year to offer us an exclusive review of their newest mp3 player. At first, we weren’t interested in reviewing a generic media player from an unknown company—that was before the company’s persistent marketing rep dropped hints that the player in question would be licensed to a well-known Internet company as the audio player associated with a new online music service to be launched later this year. The only thing we know is that the “well-known” company’s name “begins with an A and ends with .com”. Whether this is a legitimate claim or a desperate attempt to obtain media coverage for yet another mp3 player, we were intrigued enough to evaluate the new Prism DuroSport 6000. Regardless of whether or not the new Prism DuroSport is part of a new online music store launch, we’re certain DuroSport will be a household name in no time – but not necessarily for the right reasons. While it may seem hard to believe, the Prism DuroSport 6000 is not the worst product we’ve been asked to review. The DuroSport company produces a line of accessories that are every bit as unique as their digital audio player.